A non-believer born in Egypt and raised in France by his Copt parents, filmmaker Namir Abdel Messeeh has a complicated relationship with his ethnoreligious heritage. 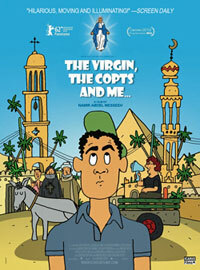 THE VIRGIN, THE COPTS AND ME is playful and warm personal account of his attempt to better understand his roots while making his first feature film. After watching a video said to depict an appearance of the Virgin Mary in the region of his birthplace, Abdel Messeeh decides to head to Egypt to explore the claims of Marian apparitions that have proliferated in the country since the famous apparitions in Zeitoun in the late 1960s. He secures a producer, as well as his mother Siham's blessing-under the condition that he not record her family. Arriving in Cairo without a plan, Abdel Messeeh finds that his investigation will be more difficult than anticipated. Clerics refuse to speak with him in detail unless authorized by church authorities, and the tension between Muslims and Copts, which lies at the heart of the filmmaker's project, is so acute that most people would rather not speak about it. Unafraid to depict his missteps, Abdel Messeeh appears in these sections as a comedically inept first-time filmmaker even as the polished onscreen result belies that conclusion. Stymied, Abdel Messeeh voyages to Asyut, in Upper Egypt, which is home to his mother's family as well as the largest concentration of Copts in the country. Reconnecting with his extended family, he finds a new, more personal emphasis for the film, but angers his producer, who drops the project, and his mother, who doesn't want to see her rural, impoverished relatives on screen. Nevertheless she agrees to join her son in Egypt and take over producing duties. With the no-nonsense Siham steering the production, things quickly come together. Rather than drily examine Egypt's relationship to the Virgin Mary, Abdel Messeeh gathers relatives and neighbors-Copts and Muslims alike-to collaborate on a film and stage their own apparition. Documenting both the process and the results, THE VIRGIN, THE COPTS AND ME turns Abdel Messeeh's personal journey into an intimate, revealing look at a marginalized Middle Eastern community. Captures the Sufi rites of the annual Opet Festival in Egypt.